Bin Weevil Company’s New Years Day Party Is TOMMOROW! We would just like to remind you that our New Years Day party is tomorrow and it would be greatly appreciated if you could come along! Why not share this post on social networking sites so people know about it? What’s Your Tinks Blocks’ and Labs’ Lab Score+ SWS mission! I was just very curious today on what your Tinks’ Blocks’ and Labs’ Lab score was! Currently – I have been playing Labs Lab and Tinks Blocks for a while now and I have got very good at it, and my score, I think is the highest in the whole Bin-scape! Even the Bin Weevils team couldn’t get my score! Your score can be anything in Bin Weevils! Just comment below with your score on Bin Weevils! The Bin Weevil Company team would love to hear what your score is! Bin Weevils have also updates there games’ in the Bin! The update is that they have increased the limit of Mulch and XP so if you want to level up, play these games in the Bin and try to win! Pool, Konnect Mulch, Squares and Flip Mulch! Also, as quickly reported on the Whats’ New Blog, the SWS mission, the Big Bin’s Freeze has now been released for everyone to have a go at! You don’t longer need to get a Bin Tycoon for this SWS mission, it’s free! So what are you waiting for? – Log into Bin Weevils now and receive the fun the new mission gives you on Bin Weevils! Defeat the THUG’s – and so much more! Weevily Christmas Cards to Print & Colour! Its so close to Christmas and right now, you can get your free printable cards to celebrate it, to share with your family or even your friends! Bin Weevils are allowing you to print off cards this year will be shown below. Why not surprise your family and friends by coloring-in one of these festive Bin Weevils Christmas cards? They’d sure like it! Click on the buttons below to print these colouring-in pages as a foldable card or A4 poster! We think these cards are BIN-TASTIC! Welcoming Yoshi6601 To Bin Weevil Company! I’m yoshi6601, and I’m the brand new author for this Bin Tastic Bin Weevils fan blog, Bin Weevil Company. Before I introduce myself, I’d just like to quickly thank my awesome buddy, hf556 for inviting me to the blog. I just can’t wait to get started! As I mentioned earlier in the post, my name is yoshi6601, but you can call me Yoshi. I’m a 12 year old blogger and avid gamer. I just can’t get enough of playing the whacky world of Bin Weevils, which is why I love blogging about it. I joined Bin Weevils around early 2011, and am a fairly old weevil. I am a Bin Tycoon, and have my very own Bin Pet named, jack. My favourite things about Bin Weevils are the brand new updates and party’s, chatting to my weevily friends and just having fun. I hope you enjoyed my introductory post for Bin Weevil Company, and I can’t wait to see what the future holds. I also have my very own Bin Tastic Bin Weevils Blog called, The Weevily Gang, and you can visit it by clicking here. Eddzy Leaves Bin Weevil Company! We regret to say our co-owner here at Bin Weevil Company, has sadly taken the decision to leave the blogging community. Eddzy has worked on this blog since the release of it back in May 2013, but sadly all good things have to eventually come to an end. Don’t worry though, me (hf556), Tiny-Weevil and Dumdawg will work extra hard to make sure you’re still updated with the latest Bin Weevils cheats, tips, secrets and more, so please do not be disheartened by Eddzy leaving the team. Play Some Old Bin Games While You Wait! While Bin Weevils is offline, Bin Weevil Company would love you to play some old Bin games which were available in the old Bin! These games are absolutely Bin-tastic & they’ll keep you entertained while Bin Weevils is offline. Simply click here to start playing the old Bin games. Bin Weevil Company hopes Bin Weevils will be online soon, for now we must keep clam and wait! Have a wonderful day everyone! New Scribbles’ Birthday Bundle At Nestco! The Bin’s best reporter is celebrating his birthday all this month! To celebrate Scribbles’ Birthday Extravaganza head over to Nestco to purchase the brand new Scribbles’ Birthday Bundle! This bundle is Bin-tastic & is perfect for creating Scribbles-themed nest rooms to celebrate Scribbles’ Birthday throughout this month! Did you know? There’s many Scribbles items sold separately at Nestco too! We would like to take this opportunity to show you hf556’s brand-new Scribbles themed room! Comment below with what you think of it. Bin Weevil Company Welcomes Dumdawg! I would like to take this opportunity to announce Bin Weevil Company has a brand new author, Dumdawg! I’m a friendly Bin Weevil & I love to write about my adventures through the Binscape, with my Bin buddies or even my Bin Pet, Blufast! 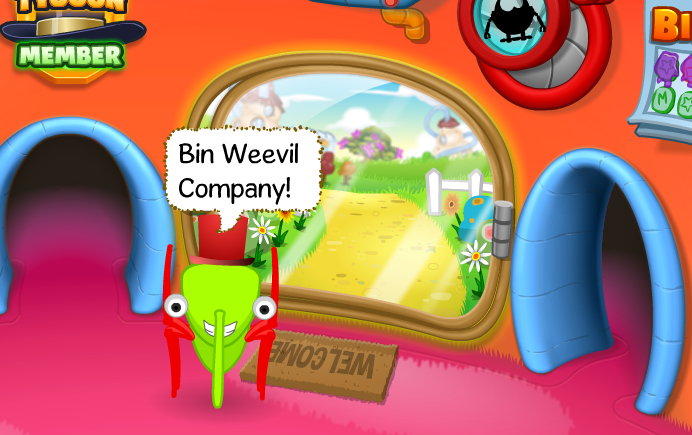 I will be writing Bin-tastic blog posts here on Bin Weevil Company! I’m very happy to bring my spectacular blogging skills to this blog, and I’m excited to start writing all the latest news from the Binscape! Mystery Code For Smyths Toy Shop Wallpaper + Information About Tabet! I’m Tabet and if you don’t already know me, I’m the gardening expert, over here at Bin Weevil Company and I run the gardens help page, have you visited it yet? Yep, you’re wondering why I’m writing a post here and why I’ve stuck an image of the Smyths Toy Wallpaper at the top of the post, aren’t you all? Let me explain… I now really like designing nests, but I still have my green thumb! This means.. I am now the official garden and nest expert here on Bin Weevil Company and I’ll be bringing you all the latest wacky codes on the awesome (agree with me, it’s awesome?) game of Bin Weevils. To claim your free Smyths Toy Store wallpaper on Bin Weevils, weevil on over to the Mystery Code Machine, and I don’t need to explain where it is, because that just takes up time…, and enter the following code.. wait, any guesses on what it is? No? Okay, here’s the code you need to enter to get the wallpaper? I’m sure you’re well aware you can get more codes (you know something surprising, they’re all unique..) on our secret codes page. Wear a Football Hat and Win! As a little treat to get the World Cup started, we have all been offered an exclusive nest item in dedication of this exciting event! All that the team ask you to do is wear your football hat around the Binscape. If your hat is noticed, you can get your hands on cool bunting nest item! Isn’t that awesome? Have you not got your own Football Hat yet? Be sure to go quickly to Hem’s Hats that is inside Dosh’s Palace and collect your own for a bargain price! Once you have been spotted by a team member for wearing a Football Hat, you’ll receive a message notifying you that you have earned it. You’ll get a message from the popular and funny Tink himself! If you head on over to the My Little Pony arena over at Rigg’s Movie Multiplex, you’ll be able to view Tink’s favourite episode out of the entire series! For the new few weeks, Bin Weevils celebrities will be choosing their favourite episode from the series and will screen every Friday! Be on the look out for them! Stay tuned for more exclusive My Little Pony content, coming soon to Bin Weevils. Be sure to be come and visit us again soon to find more on this! HAVE YOU SEEN OUR WORLD CUP HEADER? If you haven’t done so already, go and check out our brand new World Cup header to celebrate this exciting event that everyone is excited about! We would also like to thank designer, Emeeyceey for creating the header for us to display on here.